On July 30th, CNBC’s Jim Cramer told his viewers: Yes, The Market Has Bottomed. I am indeed sticking my neck out right here, right now, declaring emphatically that I believe the market will not revisit the panicked lows it hit on July 15. And I think anyone out there whos waiting for that low to be breached is in for a big disappointment, and [theyre] missing a great deal of upside. Stop waiting, buy the next dip because I think it might be the last big one. Cramer went on to recommend buying Lehman Brothers, Citigroup and Wachovia. A week earlier on July 24th, I said Hope Your 401K is in Fixed Income. In a bear market preservation of capital not appreciation of capital is your number one goal. We know what happened next. The banks got smacked. Lehman Brothers went bust and the S&P 500 ended the year down 30% from that week in July. Cramer is a legendary stock picker from the last bull market. Well, if you read his book, you know it was actually his wife. The thing is we are in a secular bear market and his mad money skillz don’t seem to be working. Jim Cramer is not alone. An entire generation of financial professionals grew up working in the longest bull market in history and its all they know. Jim is a performer for a network that makes money from advertisers whose sole mission is to keep you fully invested in the stock market all the time. Telling you to wait out the bear market in fixed income for a few years won’t pay the bills at CNBC or Fortune magazine. Stay tuned for my 2009 financial thoughts post. Guess what? It is far from safe to get back in the pool. well said indeed! And you are right on about Cramers wife calling the shots. Jim is just an orator. My amazement at the audacity and the hubris of the clowns out there that claim to be experts is only exceeded by my amazement of the stupidity of those who continue to support them. Strangely I am reminded of Socrates …he claimed to be the smartest man in Athens …because he was the only one who realized that given the vastness of all that there is to know, he knew relatively nothing. 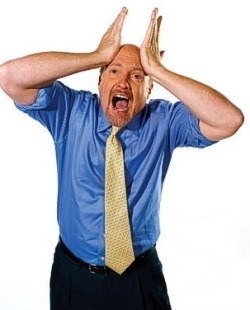 In stark contrast stands Cramer (and the rest of his ilk) …they know nothing, but claim to know everything. I was channel-surfing last night (New Years Eve) and realized that the world has been surrendered to the “beautiful people.” Local or national coverage didn’t seem to matter …it was all shiny people with mindless smiles, shrill voices and 1-dimensional comments. I used to tease my 16 year old daughter that good music was easy to spot …it was made by ugly people (Dylan, Lennon, Young, Jagger, etc.). Cramer is certainly not beautiful …but he is still part of this malaise. He sells …just like beautiful people. It doesn’t matter if he is right, or truthful, or insightful …he sells. America has to get beyond this BS. Moving product is important, but it should not replace truth and decency. As a nation, we have a long hard road ahead. Quitting TV over a year ago has made me a better investor. You don’t realize just how mindless it is until months after you turn it off. I completely agree with you, Jim and MAS. Turning off the TV was painful for me at first, but it has been a blessing.